It is this idea that a portrait should combine a clear factual gaze with empathy for the subject which appeals to me about Evans’s work. I think that the reason why I find this approach compelling is because of my increasing distaste for and annoyance with portraiture in contemporary visual culture. It has always been the case that celebrity portraiture has been ‘doctored’ to flatter the famous. In today’s digital world however re-touching (and even remodelling) is the norm. It is rare that one can look at a portrait, fashion or advertising image where one feels that the person represented truly looks as they appear in the photograph. Why is this important to me? Well I guess it’s because I believe that photography’s great strength is that a photograph is both iconic (the image resembles the referent) and indexical (there is a direct physical relationship between the referent and the photograph). For a photographic portrait to exist the subject must have been there in front of the camera and at that moment the portrait subject looked as they appear in the photograph…or did they? Digital manipulation of portrait images these days seriously disrupts both the iconic and indexical value of the photographic image. These days it is not simply a matter of removing a few wrinkles and blemishes. Eyes are widened. Noses refined. Lips made more luscious. Necks made more elegant and so on. The resulting portrait is nothing more than a fiction more akin to a painted portrait. Of course in history many of the most successful portrait painters have flattered their subjects. 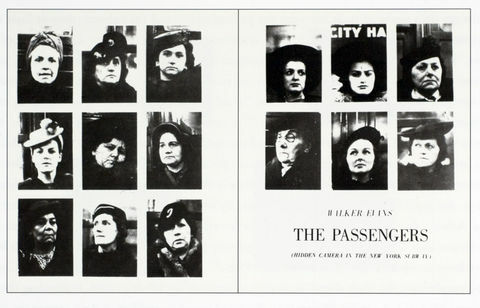 Returning now to Walker Evans. 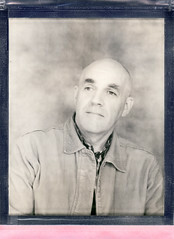 Whilst Evans made portraits, he is perhaps best known for his photographs of the American urban landscape in the 1930s. In his supporting text for Evans’ American Photographs Lincoln Kernstein says “The most characteristic single feature of Evans’ work is its purity…It is ‘straight’ photography not only in technique but in the rigorous directness of its way of looking.” (Evans 2012, pp 198) This is also the style he brought to his portraiture. Perhaps Evans’ most well known portrait is the portrait he made of Alabama Farmer’s wife Allie Mae Burroughs see here. Evans made four exposures of Allie Mae when making her portrait, two of which have been published. The composition was identical for all of them. Allie Mae is pictured alone. The portrait shows her head and shoulders. She is facing the viewer frontally. The lighting is plain. The background is plain wooden boarding. 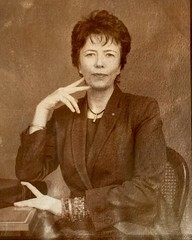 In one of the published photographs she is half smiling (American Photographs). In the other she has a sterner look (Let Us Now Praise Famous Men). Allie Mae stares directly at the viewer and whilst her face bears the hallmarks of a hard life she carries herself with great dignity. As Lionel Trilling says “Mrs[Burroughs], with all her misery and perhaps with a touch of pity for herself, simply refuses to be an object of your “social consciousness”: she refuses to be an object at all – everything in the picture proclaims her to be all subject ” (Thompson 2012, location 366 of 686). The truth is however that this portrait of Ellie Mae’s has now become an icon, representing Depression Era America. 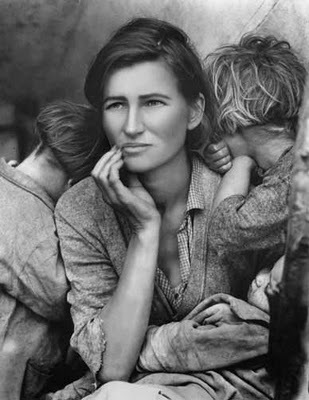 It is interesting to compare Evans’s portrait with Dorothea Lange’s Migrant Mother photograph which is probably even more well know. Jerry Thompson points out that “Lange in particular was drawn to tableau-like configurations suggestive of a moving narrative…” (Thompson 2012, location 469 of 686). This is certainly evident in this photograph with the mother’s hand gesture, the children’s faces turned away and the baby in her lap. Lange took 6 images, 5 of which I have located here. Whereas Evans had known (and even stayed with Agee in the Burrough’s house) for some weeks, Lange came across her subject,Florence Owens Thompson, as she was driving by. It appears to me from the above series of photograph’s that Lange gradually approached the family and slowly directed the scene in front of her. She first photograph is shot from distance. The second the mother is accompanied only by her baby. By the final image the other two children are in the frame looking away and the composition has taken on a much more symbolic form. Is this great opportunistic photography or exploitation of a situation to create an image? Personally I believe that Evans’ portrait is a more genuine representation of his subject, Allie Mae. I also feel that his approach was probably less exploitative and more collaborative. Lange’s portrait on the other hand is arguably more compelling and emotional.But is it an honest representation of her subject or a photographic representation constructed to convey a prescribed message. I am sure there are many different views about this. Kathy Grove has suggested that these days the photographic artifice might have been taken one step further…. I love your work, the research really puts portrait in the landscape into perspective and these particular portraits (set ups or not) really evoke a thought that things are not getting much better. The difficulty I have is that if I’ve never seen the person how do I know whether it’s a ‘true’ representation or not – at least so fear as my perception of that person is. I can guess that Florence Thompson had a pretty hard life and Lange’s portraits of her do appear to show a woman maybe parched by sun and yet with a strength of character that shines through. I also guess that Florence was quite a fine looking woman, even given her lifestyle – that’s from looking at her bone structure and the fullness of her lips. Kathy’s Grove’s version just looks so false to me – the face is that of a younger woman untouched by time and troubles, smoothed-out.. I can’t actually see the hallmarks of a hard life on Evan’s portrait of Ellie Mae. She looks very young (maybe it’s because this particular exposure is more high key.) Strangely enough she has a vague resemblance to Florence – as if she is her younger sister. What do you think of the portrait of the Duchess of Cambridge then? I don’t think it does her youth and beauty justice- but then I’ve never actually seen her in person! Not seen the portrait of the Duchess except on the TV…looks photo-realistic over the airwaves…and she is smiling. Ellie Mae was in fact 27 years old and had four kids. She worked on their smallholding in the mornings, picked cotton in the afternoons and cooked for the family and kept house in the evenings. The light is harsh and frontal so the lines on her face (if there are any – she was after all only 27) would not be so prominent. Her mouth is closed because she was self conscious about her bad teeth. You are right about Florence she had a very striking face. Florence and her family were apparently travelling on US Highway 101 when their car broke down. Her husband and two kids had gone off to town to get it fixed. Florence and the remaining kids were in a temporary shelter waiting for them. What concerns me about the Lange portrait is that Florence and her kids have been photographed without warning, out of their normal context and in a group pose which seems to have been directed to further the reputation of the photographer and the political needs of those paying her. It is a classic Madonna and child set-up just what the US Resettlement Administration needed for their propaganda. Apparently Lange’s supporting storyline contained many inaccuracies (according to Florence), never delivered copies of the photographs to Florence and her family and had allegedly promised that the photographs would not be published. There is so much myth regarding this image (Lange’s) that it is difficult to know where the truth begins/ends and the myth begins. Florence’s husband was dead when this picture was taken, she had teamed up with another man and this chap she was with ‘may’ have been getting parts to fix the radiator, ‘may’ have been looking for work, ‘may’ have been selling the tyres who really knows anymore. There is a audio piece with hervoice referenced in a piece I wrote about this picture here http://umneygm.wordpress.com/2012/10/12/dorothea-lange/ At least we can imagine the image you show (which I guess comes from the national archive) has the appearance of truth showing as it does the whole neg’? Thanks for the links John….excellent post by the way. Yes this photograph is surrounded in myth. The key question you raise is whether the means justifies the end. I can see that the photograph was instrumental in changing attitudes towards relief efforts and in this sense it was for the good. But I do wonder if that was in the mind of Lange at the time. Or was she after the iconic shot which would also serve the purpose of furthering her career. We shall never know. I came across this photograph not so long ago http://imgur.com/Y6D4l . It really made me wonder if the means does justify the end…there has to be a line drawn somewhere. I enjoyed listening to the audio interview. Made me think about how combining audio and image is very powerful. I think the end justifies the means, as long as I believe in the narrative! I jest. It is knowing that there is a reason for everything in the frame to be there, for a purpose, that was my “Damascus” moment some time ago. Your link reminded me of another; Jose, I think, provided a link to a story in Israel about the way in which photographers are regularly invited to take staged photographs which are both therefore, a manipulated image and a manipulation of the audience they are provided for – Palestinians throwing stones I seem to remember. As for Lange’s photograph, I think it is as honest as it could be, the mythology of the image isn’t anything she could have predicted, and it certainly didn’t harm her career.